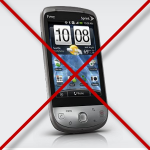 The HTC Hero Android 2.1 update (which we previewed in full here) drama can now probably get its own reality show - every week we get a leak or a "source" that promises the update "for sure this time" and then the week goes by - and nothing happens. The recent May 7th rumor was getting so old and repetitive, we didn't even consider it report-worthy, and now a Sprint community employee has indicated it indeed had no merit. Closing this thread because I don't want folks to think that 2.1 is coming out on the 7th. So it looks like if we trust a community admin with a 3.5 year old (and we're inclined to do so), you may put your waiting hat back on and sit tight (or, just get the 2.1 update by flashing DamageControl ROM - that's what I did and have been enjoying 2.1 for weeks now, without looking back). The users did not seem to like what SarahHS had to say and rated her post 1-star. We know - we all feel a little bitter about it.